(Bloomberg) -- House Democrats plan votes on two stopgap spending measures to end the partial government shutdown as a bipartisan group of senators met for the first time to discuss possible ways out of the impasse. The meeting on Monday didn’t appear to produce any conclusion, and President Donald Trump has indicated he wouldn’t sign a stopgap without the funding he’s demanding for a wall on the Mexico border, suggesting there’s no clear resolution in sight. Democrats are planning a vote Tuesday on a bill to open the nine closed departments and dozens of agencies through Feb. 1. The bill will come up under a House procedure requiring support from two-thirds of the chamber -- including minority Republicans -- to pass it. On Thursday, Democrats plan to vote on a bill to open those shuttered parts of government through Feb. 28, according to text of the bill posted on a House website. The measures are unlikely to gain GOP support and advance in the Senate because they don’t contain the $5.7 billion in wall funding sought by Trump. The funding bills “offer President Trump and Senate Republicans additional options to end the shutdown while allowing time for negotiation on border security and immigration policy," said Appropriations Committee Chairwoman Nita Lowey, a New York Democrat. Lawmakers from both parties have been trying -- so far without success -- to find a compromise. Senate Republican and Democratic moderates met Monday afternoon to try to chart a path forward. Among those participating were: Senators Mark Warner, a Virginia Democrat; Kyrsten Sinema, an Arizona Democrat; Tim Kaine, a Virginia Democrat; Lindsey Graham, a South Carolina Republican; Rob Portman, an Ohio Republican; Lamar Alexander, a Tennessee Republican; and Susan Collins, a Maine Republican. Kaine said Democrats argued that the government needs to open before talks about border security take place. “We are not having the discussion until after the government reopens,” Kaine said. 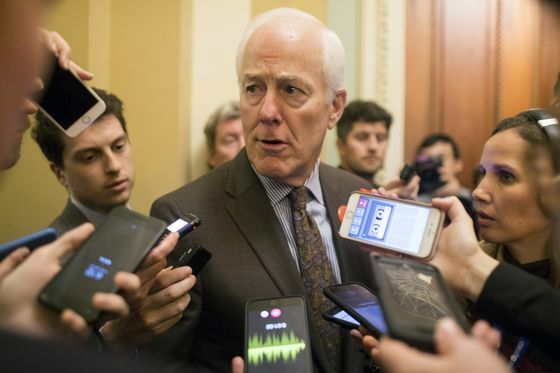 Senator John Cornyn of Texas, a GOP leadership team adviser to McConnell, said leaders are willing to consider what the senators come up with. Last week, the House passed four individual appropriations bills funding the Departments of Treasury, Agriculture, Commerce, Justice, Transportation, and Housing and Urban Development. Those bills, versions of which had previously passed the Senate on a 92-6 vote, are being blocked by Senate Majority Leader Mitch McConnell, a Kentucky Republican, who has said he won’t seek a vote on a measure opening the government unless it’s backed by Democrats and Trump. Earlier this month, House Democrats passed a package of six appropriations bills and a separate stopgap for the Homeland Security department through Feb. 8. Those bills have also been ignored in the Senate. 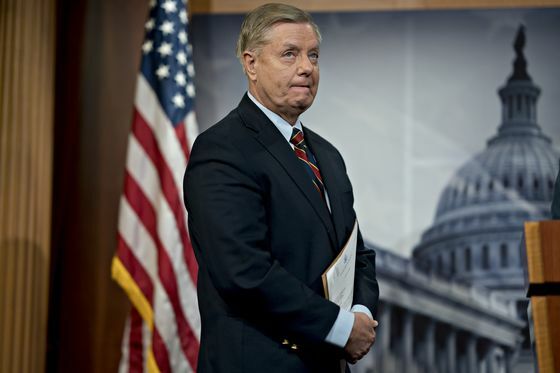 Graham, a Trump ally, over the weekend asked Trump to allow the government to open for three weeks while lawmakers debate border security. Trump told reporters Monday he has rejected that suggestion. So far the Democratic bills have only attracted a handful of House Republican defectors in a sign the party remains united in supporting Trump on the wall. Talks between Trump and Democratic leaders collapsed last week after Trump walked out of a meeting on the shutdown.